Even with all the high-tech toys on the market today, dollhouses remain popular with kids of all ages. And with so many styles and sizes, there is a dollhouse out there to match the interests of most every child. The ReviewLab team did extensive research to find the best choices for dollhouses in several popular categories, including dollhouses for toddlers, dollhouses for older kids and dollhouses that may appeal more to boys. For each of our picks, we provide detailed information about the dollhouse's key features. For more information about what you should consider when purchasing a dollhouse, see our handy buying guide below. Read more about our methodology. 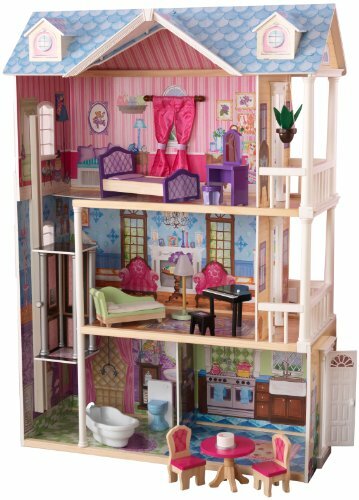 The KidKraft Majestic Mansion has realistic features, such as a working elevator, that make it stand out among other dollhouses. 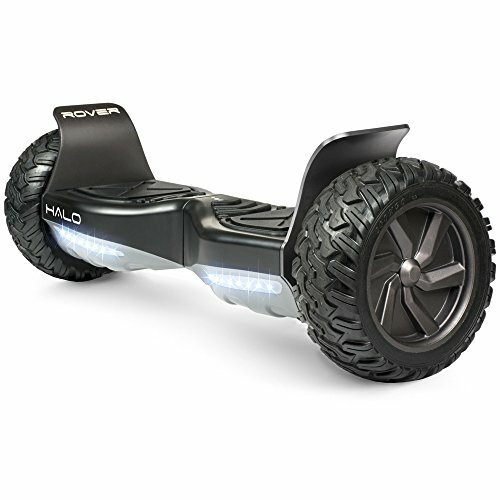 Add to that numerous accessories and sturdy wood construction, and it's easy to see why this is our top pick. For a more economical version of a wooden dollhouse that still contains many of the same amenities and features, the Best Choice Products Wooden Dollhouse is a great pick. It comes fully furnished and is large enough to accommodate large dolls. 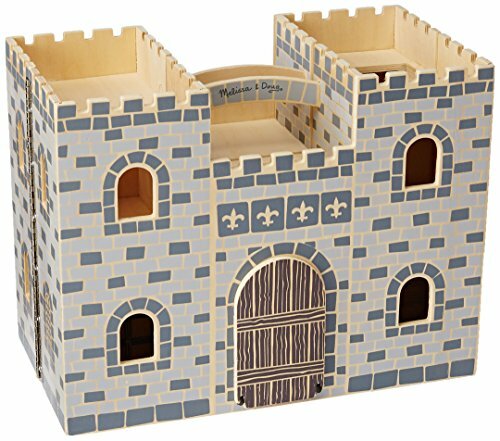 The least expensive dollhouse on our list, the Melissa & Doug Fold and Go Wooden Castle Dollhouse is an excellent value. Perfect for small spaces, this dollhouse has handles for easy portability. 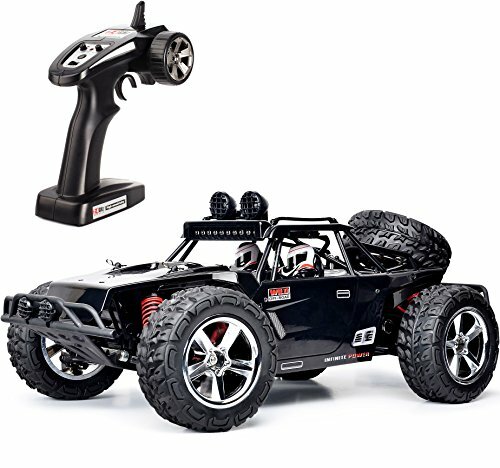 It comes with several of its own play figures and comes fully assembled. While it's not the lowest priced dollhouse on our list, the KidKraft My Dreamy Dollhouse delivers a ton of value for the price. With realistic features, such as lamps that light up, and lots of accessories this dollhouse provides everything you need in a single purchase. If you’re looking for a dollhouse designed just for toddlers in mind, the Fisher-Price My First Dollhouse is a perfect fit. It's colorful and packed with age-appropriate accessories. 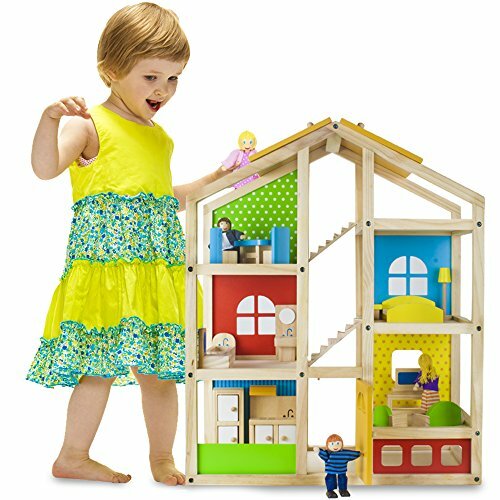 With sturdy, block-like figures and accessories and bright, inviting colors, the Wooden Wonders Tall Townhome Dollhouse is the perfect choice for your slightly older toddler. Numerous furniture pieces and a family of dolls complete this make-believe setting, providing hours of creative fun for your child and their friends. Complete with a whimsical, elegant appeal, handcrafted furniture, bed linens and cushions, the KidKraft Savannah Dollhouse is an excellent choice for older children desiring a more sophisticated and intricate décor. If you’re searching for that perfect dollhouse for your older child, the Melissa & Doug Classic Heirloom Victorian Wooden Dollhouse has intricate and realistic Victorian detailing, making the perfect setting for your child’s “older” dolls and a wonderful showpiece for later years. The KidKraft Everyday Heroes Play Set is a great choice for boys (and girls) who crave action and adventure. Complete with fire station and police station all rolled into one, this dollhouse is perfect for your little hero enthusiast and includes numerous accessories, vehicles and play figures for instant imaginary fun. The age of your child is a huge consideration when selecting a dollhouse. For young kids, look for a simple, sturdy dollhouse with larger accessories that do not pose a choking hazard. Older kids often enjoy dollhouses with more intricate designs and tiny accessories, such as dishes and furniture. Some dollhouses are pretty much ready to use right out of the box. Others, however, require extensive assembly. When selecting a dollhouse, be sure to be aware of the degree of assembly that will be required. Size is another important factor to consider when selecting a dollhouse. Some are compact and portable, while others require a dedicated space that is large enough for the dollhouse and for the children playing with it. If your child already has dolls that they want to use with the dollhouse, be sure to select a dollhouse large enough to accommodate them. Many dollhouses come with a variety of accessories – from dolls to furniture, dishes and more. In other cases, accessories have to be purchased separately. Simple plastic dollhouses that appeal to younger kids can be purchased for less than $30. Larger wooden dollhouses with many accessories can range from $50 and higher. The KidKraft Majestic Mansion can be easily matched with your child’s favorite doll for countless hours of make-believe fun. This dollhouse’s numerous accessories (like 34 furniture pieces, including a grandfather clock and a little kitten) and amenities, such as a working elevator, swinging garage doors and multiple windows, give it an edge over other models. The wood construction provides a sturdy frame that should last for years, and the dollhouse’s detailed design, multiple rooms and large size ensure your child will be able to grow older and taller and still enjoy playing with this dollhouse. Wooden construction. Users report that the wood construction is very durable, sturdy and solid, providing a great choice that will survive throughout the years of your child’s growth. Multiple accessories. With 34 accessories, including a grandfather clock, kitten and plenty of furniture, your child can begin playing right away. Some users also praise the durability of the wooden furniture. Large size. This dollhouse is four and a half feet tall and can accommodate dolls that are up to 12" tall. Several reviewers say the large size makes it great for households with multiple children, with some noting that the size makes for a more immersive play experience. Multiple rooms and amenities. This dollhouse has eight rooms and includes little touches of modern luxury, such as swinging garage doors and a working elevator for more realistic play. Construction can be time-consuming. Putting this dollhouse together can take over two hours, but reviewers note that the time spent is well worth it. Poor Instructions. Some users reported that the instructions were not very clear, making the construction more difficult than necessary. The Best Choice Products Wooden Dollhouse provides a great option for those looking for a wooden construction that is more economical. Made with eco-friendly materials, this makes a great choice for the environmentally conscious or those looking for additional safety features for smaller children. It also includes multiple furniture accessories and attractive features like three stories, staircases and a balcony, providing countless hours of play fun for your imaginative child. Eco-friendly. 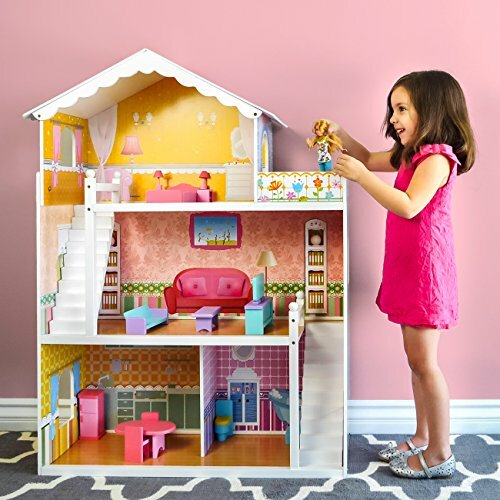 This dollhouse is designed with eco-friendly MDF and non-toxic paint, making it a safe choice for your child, especially if you have younger children in the house that still like to chew on things. Comes with wooden furniture. If you are looking for a dollhouse that includes some accessories, this Best Choice Products Wooden Dollhouse comes with 17 mini wooden pieces of furniture to provide a house ready for instant play. Multiple stories. This dollhouse has three stories with rooms large enough to accommodate dolls up to 14” and includes all the main rooms of a real house, including a bathroom, which some users say they were able to use as a potty-training motivator for their toddlers. Large size. At almost four feet tall with staircases and a balcony, this is an excellent choice that can grow with your child and accommodate play with your child’s friends as well. Several users stated that the large size made it easy for their children to enjoy with all size dolls. Poor Instructions. Several users stated that the instructions were poorly written, but they also gave it a good rating due to how nice the house looked when finished and how much their children enjoyed playing with it. 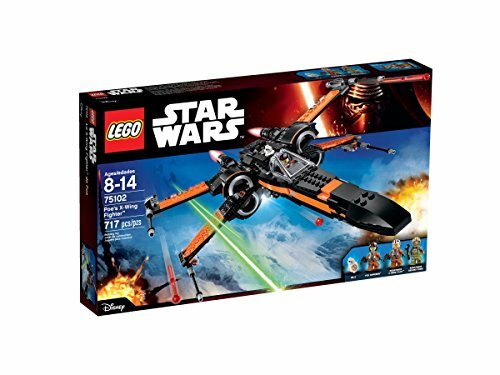 Smaller parts break easily. Users reported that the smaller parts, like the furniture, came apart easily, but some stated that it was an easy fix to re-glue them. Not only is the Melissa & Doug Fold and Go Wooden Castle Dollhouse portable and easy to store, but it also comes already assembled and with several play figures, including horses and a treasure chest, to provide countless hours of instant play fun without the hassle of constructing beforehand. Perfect for small children or those who travel, this dollhouse includes two stories and multiple rooms. Entertaining accessories. This castle dollhouse comes complete with king, queen, thrones, bed, treasure chest and even two knights with horses. Multiple rooms. This castle is two stories and contains multiple rooms, windows and staircases, including a dungeon and a working drawbridge. Portability. This castle dollhouse folds up for storage and includes carrying handles so that you can take and play, making it a perfect fit for smaller dwellings like apartments and for children who would like to take their favorite playset on trips. Users say that this dollhouse fits easily in the car and kept their children busy in hotels. Some even mention that it was a great choice for taking along to doctor’s appointments. Pre-assembled. Just take it out of the box and play. Some users expressed excitement over the fact that it was already assembled, stating that it was a great option for its price. No latch for closure. Some users say that they wish there was a latch to keep the playset closed when folded up. The KidKraft My Dreamy Dollhouse is a great value for the amenities and accessories included, such as the 14 pieces of furniture – even a hanging plant – a piano that plays, a flushing toilet and lamps that light up. 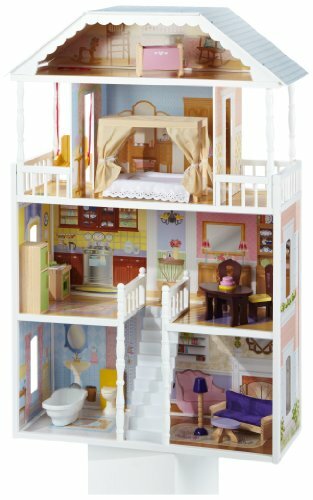 It even has a working elevator that goes to all three spacious levels and its large size easily accommodates Barbie-sized dolls, making it a perfect choice for those wanting a dollhouse that will last throughout childhood. Realistic features. With a flushing toilet, lamps that light up, a piano that plays and a working elevator, this dollhouse is a great choice for realistic play in a modern setting. Some users say that the realistic features provided their children with hours of enjoyment, and that the flushing toilet was their children’s favorite feature. Multiple accessories. This dollhouse comes with 14 pieces of furniture, including a piano that plays and a hanging plant to add more detail. There are also more KidKraft accessories that can be purchased to fit the dollhouse. Large size. At around four feet tall, the dollhouse has three stories, an elevator that goes to all three levels, four rooms and two balconies. The large room size accommodates Barbie-sized dolls and is a perfect choice for your child to play with friends. Artistically decorated. With intricate details on the outside and inside of the house, it is easy to escape into a land of pretend with such realistic features. There is even decorative and intricate crown molding on the working front door. Some users express satisfaction with the artistic décor, stating that the level of detail is amazing and the decorated walls are adorable. Elevator sticks. Some users say that the elevator could get stuck at times, but they add it is easy to fix. Length of time to assemble. Some users note that you should allow several hours for assembly. Some dollhouses are manufactured especially for younger children. Typically, these do not include small, removable parts or accessories. Dollhouses for toddlers are less ornate than those meant for older kids, and they often feature bright, fun colors. 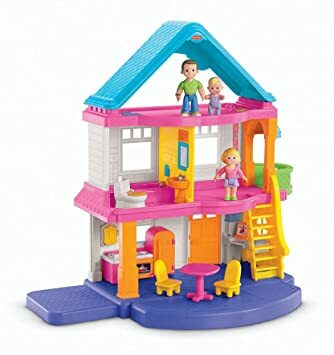 Designed for kids 24 months to five years of age, the Fisher-Price Loving Family, My First Dollhouse features more solidly built, larger parts and accessories that are easier for small hands to grasp and less likely to pose a choking hazard. Complete with a family of figures, moveable furnishings and three stories of rooms, this dollhouse will provide hours of imaginative play. Made specifically for toddlers. At an age range of 24 months to five years, this dollhouse is designed specifically for a toddler in mind. Accessories included. With some furniture and mom, dad and figures included, your toddler can enjoy imaginative fun right out of the box. Convenient smaller size. At a height of slightly under two feet, this dollhouse is the perfect size for a toddler, and is also a great addition to a smaller, nursery-sized room. Some users say that the size was perfect for smaller spaces and smaller children, but big enough for small hands to enjoy. Multiple rooms. With three stories, this dollhouse manages to pack in five rooms filled with fun play despite being a smaller size, which makes it perfect for small hands to explore. No sound. Some users express disappointment that there are no sounds included with the dollhouse, unlike some Fisher-Price products. The Wooden Wonders Tall Townhome Dollhouse offers a great alternative for parents desiring a dollhouse designed for toddlers that are slightly older, and also makes a great first choice for a wooden dollhouse. With bright colors, three stories and six rooms of play, your toddler can enjoy all the benefits of a larger, more intricate dollhouse but without the necessity for more space and the risk factors of smaller accessories. Designed for ages three and up, your toddler can play for hours with the included 16 pieces of furniture and four dolls. Big enough for multiple playmates. At 24” tall, this dollhouse includes six good-sized rooms and three stories of playing fun. Some users say that this was a nice-sized dollhouse that would fit into a small room at a reasonable price. Multiple Accessories. This dollhouse includes 16 pieces of brightly-colored furniture, along with four poseable textile and wooden dolls to make your child’s play world complete. Several users note that their kids love the accessories and that the dollhouse has everything needed for furniture arranging and doll play. Sturdy and safe construction. This exciting townhome is built with real cuts of all-natural wood and colored with safe paints to provide a worry-free playing environment for the younger child. Difficulty with assembly. Some users say they had difficulty assembling the dollhouse, adding that there were parts that didn’t line up correctly and some that easily broke. Dollhouses for older children often have more intricate designs and more accessories than those intended for younger kids. Sometimes, these dollhouses are on the smaller side, intended more for display than active play. But there are plenty of larger options, as well. The elegantly crafted KidKraft Savannah Dollhouse is a perfect choice for your older child. Built with a southern charm, four levels of play and six spacious rooms provide for countless hours of make-believe play with your child’s favorite dolls. Its larger size is perfect for taller children, and it even has a lamp that really lights up at the push of a button. Fourteen pieces of handcrafted furniture, including bed linens and cushions, complete this intricately designed dollhouse. Taller size. Standing at over four feet tall, this dollhouse is perfect for an older child and their friends to enjoy numerous adventures in the land of make-believe and dolls. The larger size is great for Barbie dolls. Multiple users express satisfaction with the tall size, stating that there was plenty of room for growth. Multiple rooms and levels. 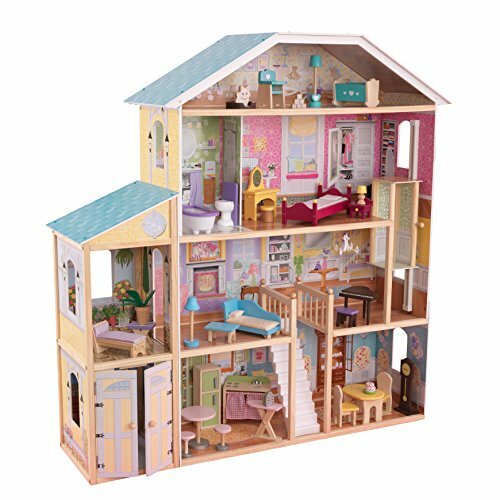 The KidKraft Savannah Dollhouse offers four whole levels and six large rooms for plenty of play and space for additional accessories. Numerous handmade accessories. Fourteen pieces of handcrafted and hand-painted intricately designed wooden furniture come with the dollhouse. The bed actually has real linen on it, and the couch and loveseat come complete with cushions, making this every girl’s dream house for her dolls. There is even a lamp that lights up at the push of a button. Sophisticated décor. The Savannah Dollhouse is decorated with a southern, old-fashioned style, providing just that perfect touch for older girls interested in detail and fashion. It also includes multiple windows and balconies to add to the feel of an old-fashioned plantation house. Users say that the dollhouse has an elegant look, and that the wall décor is part of the walls, so no need to place on the stickers yourself. Length of assembly. Some users say that it took longer than two hours to assemble this dollhouse. Your child’s dolls can live in a true Victorian mansion in this Melissa & Doug Classic Heirloom Victorian Wooden Dollhouse. Realistic shingles, accents, ornate window frames and elegant staircases complete this whimsical setting, along with full-color and detailed interior graphics. The smaller size is perfect for a display setting for older children, but is also the right size for hours of sophisticated play. This dollhouse can grow with your child and provide a great showpiece through adulthood. Realistic and intricate detailing. The realistic detailing is made in Victorian style, and comes complete with hand-painted shingles on the roof, scroll-cut accents, ornate window frames and elegant staircases. Interior graphics. Full-color interior graphics are unique to every room, include turned balusters and wonderful finished floors, and provide a truly realistic setting with a sophisticated flair. Smaller size. At a height of slightly over two feet, this dollhouse is geared more towards older children and collectors, and makes a beautiful sidepiece to your older child’s room. 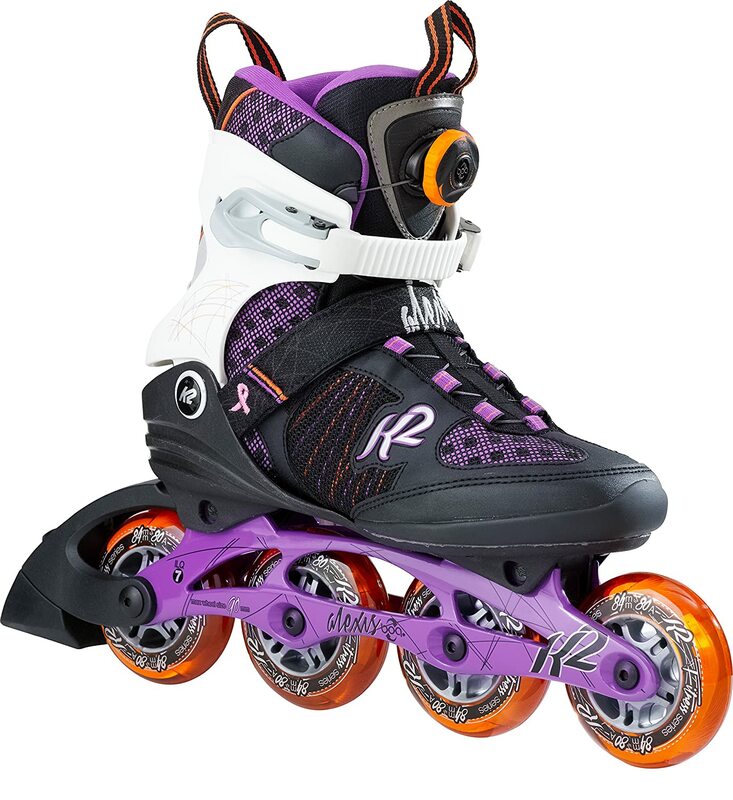 Some users mention that it is a great size and height for a child to enjoy, but was also a perfect size and style for an older child to display. Accessory packages available. 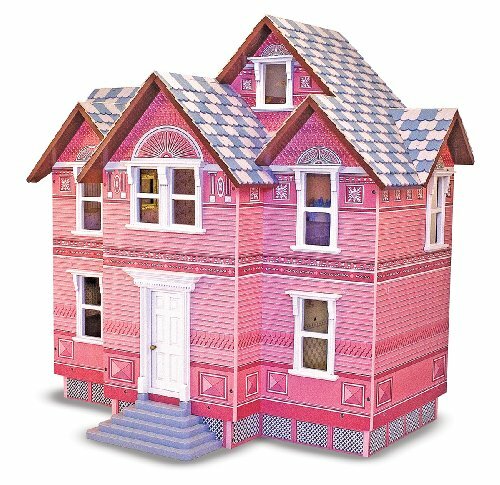 Melissa & Doug have accessories available that are designed specifically for their Victorian dollhouse, including a Victorian Dollhouse Family. Instead of having to settle for pieces that are automatically included in some dollhouses, your child can enjoy hand-picking specific sets that fit their own unique style and flair. Broken pieces. Some users report that the dollhouse came with broken pieces. In the cases where they contacted Melissa & Doug, they say that the company was swift to replace the items with working ones. Dollhouses marketed to boys are often action or adventure themed, but all kids can enjoy them. Pirates, police officers and firefighters are common themes for these dollhouses, and they often come with figures and other accessories, with other accessories available to be purchased separately. The KidKraft Everyday Heroes Play Set comes complete with special heroes and vehicles. It even has two dogs and a basketball hoop. With numerous wooden pieces of furniture and realistic accessories, this dollhouse provides a great choice for boys (and girls) to play make-believe with their favorite play figures. With three levels and 12 rooms, this dollhouse will provide hours of adventurous fun. Numerous accessories. 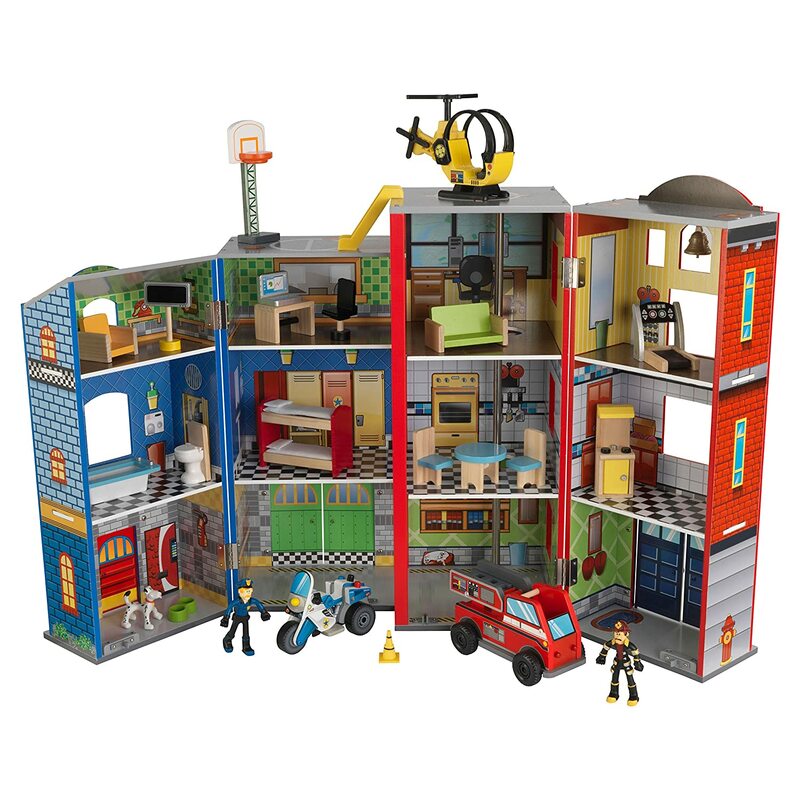 This dollhouse comes with a policeman, fireman, two dogs, police motorcycle, helicopter, firetruck and numerous other wooden furniture and accessories, including a basketball hoop. Your child can enjoy countless hours of make-believe play with all the accessories and their favorite play figures. You can even purchase additional play figures and accessories if desired. 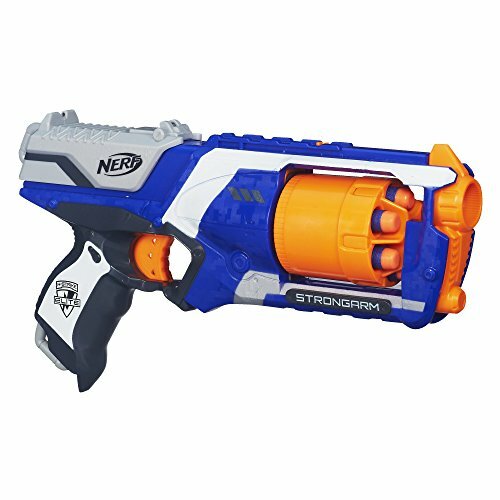 Several users say they are satisfied with the multiple and fun accessories, adding that their children love playing with them. Multiple rooms and levels. With three floors and 12 open rooms, your child and their friends can all enjoy creative play in a realistic setting while learning more about their favorite heroes. Sturdy craftsmanship. Made with MDF, fabric and plastic, this dollhouse is sturdy enough to withstand the enthusiastic play of little boys. Several users mention that this is a sturdy playhouse that was well built. Easy to store. This dollhouse even folds up for compact and easy storage, so no need for messy rooms after a long playdate. Some users say that the playhouse was great for folding up and storing with the accessories inside. Convenient size. At a height of a little over two feet and a larger width, this makes a perfect size for both younger and older children alike to enjoy. Missing/broken parts. According to some users, the dollhouse arrived with missing or broken parts. When they reported it to customer service, the company was swift to replace the parts.